Rob Kardashian will no longer have to fork over heaps of cash to Blac Chyna every month … in fact, he won’t have to pay her at all. Sources close to the former couple tell TMZ the two have hammered out a final custody agreement for their 2-year-old daughter, Dream. 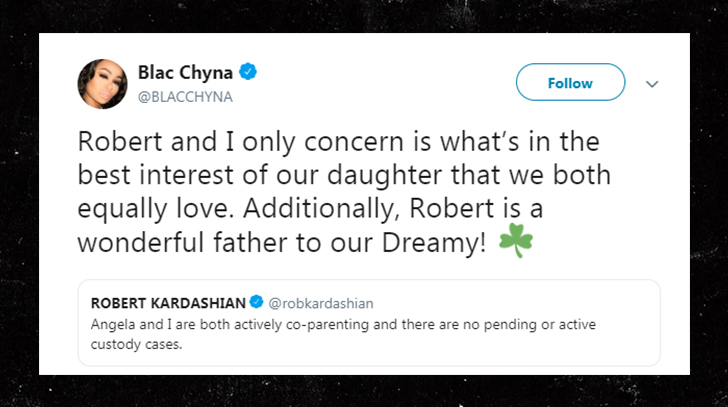 We’re told Rob and Chyna will split custody 50/50 … though Rob will likely have his daughter more of the time. What’s really incredible … Rob was paying Chyna $20K per month in support and now he’ll pay nothing. Our sources tell us the agreement states each parent will only pay for Dream’s needs when she’s with them … and things like medical expenses and school will be split down the middle. Sources familiar with the negotiations tell us on the day the final agreement was reached, Chyna arrived several hours late and dressed to the nines. After the meeting wrapped, Chyna allegedly suggested to Rob the two should go out and grab margaritas … an offer he immediately declined. Rob and Chyna have a tumultuous history … with accusations of abuse, public shaming and lawsuits. It appears all that is in the rear-view now, and Dream is their main priority.